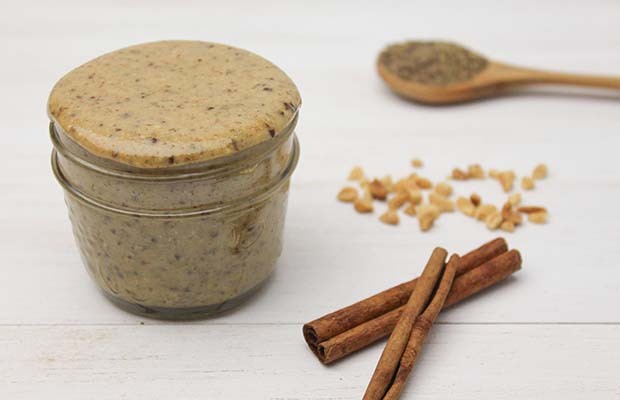 Cinnamon Twist Flax Butter is a great option for breakfast and snacks. Use it as a spread or as a dip for fruit. Preheat oven to 350°F (180°C). Place peanuts on a cookie sheet and roast for 8-10 minutes, stirring once. Remove peanuts from pan and add them to the food processor bowl. Using a food processor, process peanuts on low for 5 minutes. Add 1 Tbsp (15 mL) canola oil and continue processing for another 15 minutes, stopping every 5 minutes to scrape down the sides of the bowl. At the end of 20 minutes the nut butter should be smooth and creamy. Add remaining canola oil, flaxseed, salt, honey and cinnamon. Blend 1 minutes to combine. Store in an air tight container at room temperature for up to two months. It probably will not last that long! Yield: 1 3/4 cup (425 mL). Serving Size: 2 Tbsp (30 mL) . Each serving contains 1 tsp (5 mL) of flax. For best results it is important to use raw, unsalted nuts with no skins – you can rub the roasted nuts between a tea towel or rubbing them together in your hands to remove the skins.